Will we finally see Alicia? News is filtering through that Sony Ericsson, having released seven phones in just over a month, is going to do it again in two weeks. According to Dutch site Mobile Cowboys, a 'reliable source' has confirmed the launch of even more handsets. Now, usually rumours from a 'reliable source' aren't worth any more than a kitten in a fruit bowl, but this one may have legs given we've seen a few spy shots of phones recently that appeared to have slipped under the launch radar. The Remi, for instance, is a descendant of the T610, a popular handset for SE around four years ago. We brought you coverage of this handset a while back after a picture of the device popped up, but nothing has been seen or heard since. 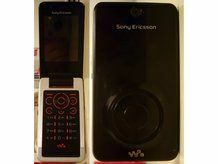 We also brought you news of the W707 (or Alicia) handset, which is a low end clamshell Walkman phone; though this may have been shelved as a handset after rumours it was bumped at the last minute by the W902 at the recent SE launch. Anyway, given Sony Ericsson's penchant for releasing waves of handsets at the moment, expect this to be another new set of phones, likely catering for the mid- to low-end of the market as the brand attempts to re-invent itself.